I'm on a roll with the pumpkin theme over here at Dance While You Cook. If you've been hanging around these parts for any amount of time you may have deduced that I am really whimsical in my postings and don't plan a thing, so this pumpkin theme in the month of October certainly wasn't intended. It's just that pumpkin is jumping out at me from every angle. And I'm jumping on board. 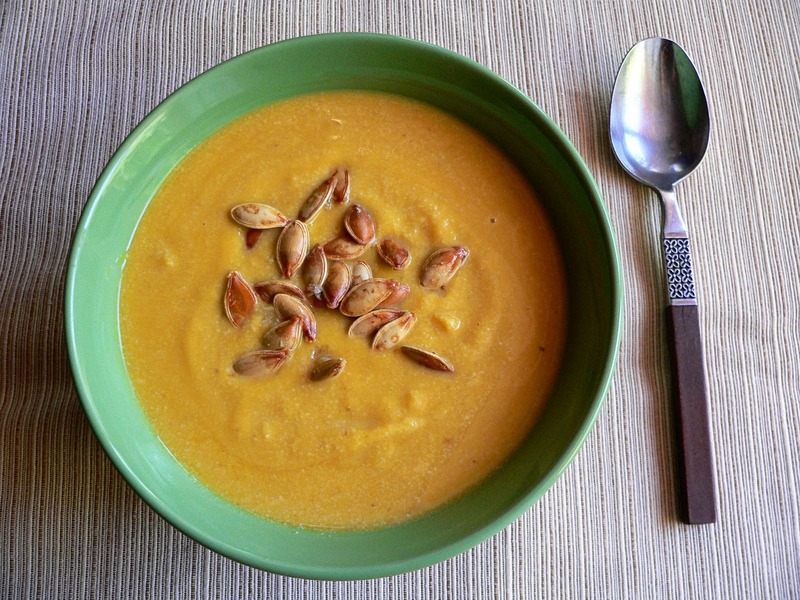 I must admit, pumpkin is so darn tasty it keeps me dancing in The Little White Kitchen all month long. Today's recipe for gluten and dairy free Creamy Roast Pumpkin Soup serves up all the rich warmth we've come to expect in a soup perfectly suited for a crisp fall evening. Cut pie pumpkins in half, seed and gut. Reserve the seeds for roasting. Spread a small amount of olive oil over the inside of the pumpkin. Sprinkle with sea salt. Place pumpkin halves flat side down in a baking dish. Roast pumpkins in preheated oven for approximately 1 hour, or until the flesh of the pumpkin is soft and can easily be scooped out of the pumpkin shell. 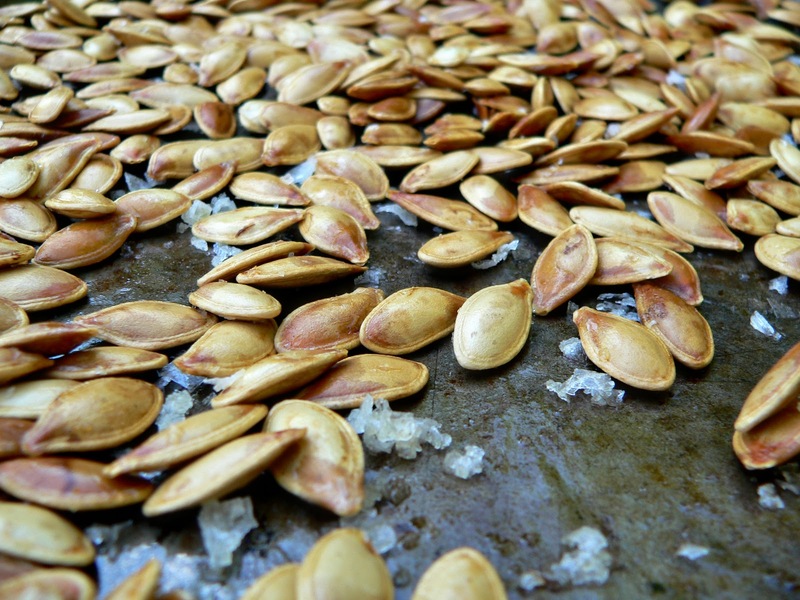 While the pumpkins are roasting, begin preparing the pumpkin seeds for toasting. Wash the pumpkin seeds in a bowl of cold water. Drain water from seeds and set aside on a towel. If soaking wet, give them a spin in the salad spinner to remove some of the excess water. In a small mixing bowl, toss pumpkin seeds with a touch of olive oil, a few dashes of cayenne pepper and some sea salt. Lay in a single layer in a baking pan. Place in the oven with the roasting pumpkins. Allow the seeds to roast until they are nice and brown, approximately 30 minutes. Be sure to stir halfway through to toast all sides evenly. Add more salt once you pull them out of the oven. Next, get all of the other materials for the soup ready. Once the roasted pumpkin is ready the rest of the soup will come together very quickly. Once the pumpkins are done roasting, scoop all of the flesh out of the shells, mush well and set aside. In a large soup pot, heat 2 tablespoons olive oil over medium-high heat. Add the diced onion and minced garlic. Cook over medium-high heat until soft and starting to brown, approximately 5 minutes. Add 1/2 teaspoon ground coriander, stir well and continue to cook for another minute. Add all of the mushed pumpkin (approximately 4 cups) and 4 cups broth. Stir well. Allow to cook for another 10 minutes. 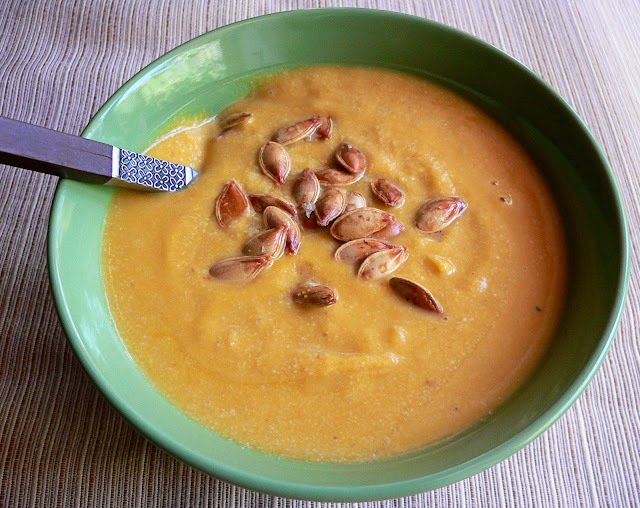 Using a submersion blender, or a standard blender, puree the soup until super smooth. Return soup to large pot and add 1/2 cup light brown sugar, 2 cups cashew cream and 1 teaspoon salt. Stir well to combine. Heat through and serve with a hearty helping of roasted pumpkin seeds as a garnish. I couldn't find a video for this song, but none-the-less, you need to listen to it. So fantastic! I have no idea what it's about, but what the heck, it's groovy. Who can complain? Anyone want to translate for me? SOOOO GOOOOD Loved getting to be the first to taste this delicious, healthy goodness! Yumm! I'm thinking this could be a new thanksgiving staple. I LOVED it!!! Great any night as well.